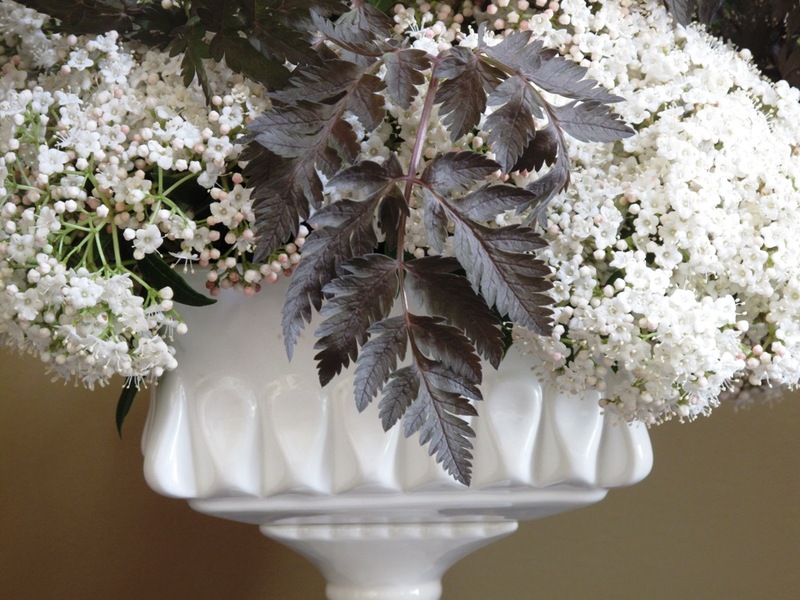 A graphic, fresh combination: dark-chocolate-colored Anthriscus sylvestris foliage with creamy white Viburnum tinus flowers. The white square dish, elevated on a pedestal, makes this simple grouping of flowers all the more special. 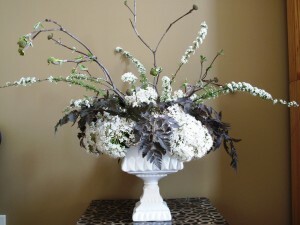 6 stems bridal wreath spirea (Spiraea cantoniensis ‘Flore Pleno’), grown by Charles Little & Co.
Elevate for importance: There’s something appealing about lifting a floral arrangement with a footed vase or dish. It’s like giving your bouquet a little stage or platform to help it rise above its environment. This is especially noticeable with an arrangement designed to be viewed on all sides, such as a centerpiece. If you don’t have a footed dish or urn, you can use a cake plate to elevate your flowers! NOTE: Each Sunday of this year, I post my photographs, a how-to “recipe” and tip for that week’s floral arrangement, created for my new book, Slow Flowers. This entry was posted on Sunday, April 7th, 2013 at 10:29 am	and is filed under Book reviews, Creativity, floral design, Gardening, General, Plants, Slow Flowers: 52 Weeks, Writing. You can follow any responses to this entry through the RSS 2.0 feed. You can leave a response, or trackback from your own site. Tanya´s last blog post ..HR Practices &#8211; Do You Have Zombies in Your Office?